The Eighth National Roundtable of Canada’s Platform for Disaster Risk Reduction (DRR) is held annually to provide an opportunity for experts and stakeholders from all areas of society to share information and support Canada’s building resilient communities as well as implementation of the United Nations’ Sendai Framework, which Canada endorsed in 2015 along with 186 other countries. We are pleased that this year Public Safety Canada (PS) co-hosted the second day of the event with Canada’s Climate Change Adaptation (CCA) Platform, the Natural Resources Canada-led national forum where members from the public and private sectors collaborate to advance Canada’s CCA priorities. We cannot reliable reduce the risks from climate-related hazards without taking CCA into consideration; as such, the work being done by these two platforms is interconnected. It was an exciting program that explored those linkages and discussed progress being made in these important areas. Strengthening these linkages will be a priority to improve both CCA and DRR in Canada moving forward. The focus of this year’s Roundtable was “Building Back Better”, one of four priorities within the Sendai Framework. Given that the Regional Platform for DRR in the Americas and the Global Platform were held earlier this year, in March and May respectively, we had an excellent opportunity to carry the momentum, continue the discussion and support the advancements made at both those events. We will continue the work of building Canada’s resiliency as well as strengthening and aligning our DRR approach with the Sendai Framework. The Ninth Annual National Roundtable will be held in Vancouver, British Columbia and will continue the discourse on the linkages between CCA and DRR that started in Halifax. We're looking forward seeing you in Vancouver! 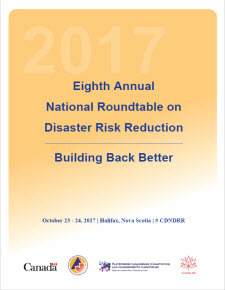 Canada’s Platform for Disaster Risk Reduction hosted the Eighth Annual National Roundtable on Disaster Risk Reduction that was held in Halifax, Nova Scotia, on October 23-24, 2017. The Roundtable brought together approximately 250 participants from across the country and beyond, with representation from all levels of government, Indigenous peoples, intergovernmental and non-governmental organizations, the private sector, academia, local communities and the general public. This year’s theme was “Building Back Better”, one of the Four Priorities for Action under the United Nations Sendai Framework for Disaster Risk Reduction. In recent years, Canada and the global community have seen an increase in the number and frequency of disasters. The trend is expected to continue and to be further amplified by climate change. This means that there is a need to strengthen disaster preparedness for response, take action in anticipation of events, ensure capacities are in place for effective response and recovery at all levels, and incorporate the impact of future climate change into each of these activities. The recovery, rehabilitation and reconstruction phase is a critical opportunity to build back better, including through integrating disaster risk reduction and climate change adaptation into development measures. The 2-day event included nine plenary sessions, eight parallel sessions and multiple networking opportunities. The second day of the Roundtable was held jointly with Canada’s Climate Change Adaptation Platform to signal the importance and value of incorporating climate change adaptation into disaster risk reduction and climate change adaptation. As an official Canada 150 event, this year’s Roundtable was also an opportunity to reflect upon 150 years of disasters in Canada, with a particular focus on the 100th anniversary of the Halifax Harbour Explosion. Across the theme of “Building Back Better”, the Roundtable brought together 46 panelists who presented the challenges and the best practices in disaster risk reduction (DRR) for Canada. For more details regarding the program, visit the website for the agenda and the virtual brochure. Reach new followers on Twitter. Stéphanie Durand, Director General, Emergency Management and Programs at Public Safety Canada and the National Chair of Canada’s Platform for DRR, and Michel C. Doré, President, Canadian Risks and Hazards Network, were the masters of ceremonies on the first day of the event. Creator, we thank you for this beautiful sunshine that we woke up to this morning, and we thank you for the cool air and the rain that cleansed and cooled Mother Earth. We pray that you send rain out West to those communities that are burning and that need your help. We ask, Creator, that you be with this group of men and women today and help them through the course of their work to open their hearts and their minds to the challenges that they have ahead. Creator, we ask that you be with our loved ones, those who are sick and need your help and guidance to get strong. And Creator, our loved ones who are preparing themselves for their final journey to you, give them strength and bravery so that they will not be afraid. And finally, Creator, we ask that you look after our veterans, those who are far from home protecting Turtle Island, keep them safe until they return into the loving arms of their family and their friends. Miigwetch. Mr. Fillmore opened the Roundtable on behalf of the Government of Canada by recognizing the opportunity for participants to strengthen community resilience by sharing ideas and innovations that can help communities, from coast to coast to coast, to reduce the risks and impacts of disasters. He acknowledged the role that Canada’s Platform for Disaster Risk Reduction plays in feeding into the Regional Platform for the Americas, which meets every year, and which in turn supports the Global Platform, representing 187 countries and advancing global progress on the Sendai Framework. The Regional Platform held in Montreal in March 2017 brought together participants from across 55 countries and territories in the Americas, and led to the endorsement of the Americas on a Regional Action Plan to meet the Sendai commitments, which included making “Building Back Better” a priority. Mr. Fillmore emphasized Canada’s 150th anniversary of Confederation by looking back upon our collective history of rebuilding after disaster strikes, including after the Halifax Explosion, which happened along the Halifax waterfront 100 years ago this year. Mr. Fillmore spoke about ongoing events particularly the severe flooding and wildfires happening across the country. He also looked to the future generations who will be living with the decisions made today, who will be living with how we, as a society, rebuild our communities. He also recognized the importance of the partnership between Public Safety Canada and Natural Resources Canada in hosting this year’s Roundtable, noting it was a strong example of the collective effort to tackle the interrelated, complex, and multi-faceted issues of reducing disaster risk and adapting to climate change. Mr. Fillmore ended his remarks by reminding participants that building back better is not simply about improving physical infrastructure – it’s about addressing human needs, risks and vulnerabilities, now and for the future. Mayor Savage spoke about some of the unique challenges faced by Halifax Regional Municipality, Canada’s largest physical city, brought about by the unpredictable effects of climate change. These challenges include higher sea levels and invasive sea life; hurricane seasons that extend later into the fall; unpredictable winters that include flash freezes, quick thaws, record-high accumulations; and storm surge becoming a regular part of weather warnings. Mayor Savage also highlighted Halifax’s role in promoting and improving emergency management in the region and beyond. He referred to the city’s Joint Emergency Management teams and Nova Scotia’s Joint Emergency Operations Centre, which involves all levels of government, as well as the Canadian Red Cross Centre for Excellence for Disaster Management, which teaches volunteers from across the province the skills they need to manage all types of disaster response. Finally, Mayor Savage spoke of the many partnerships, with other levels of government and the private sector, which are improving or adding to Halifax’s resilient infrastructure, including green infrastructure. Minister Mombourquette thanked the participants for the work they do that ultimately leads to protecting and improving their communities, particularly local emergency responders for their efforts during Nova Scotia’s recent severe storms. Minister Mombourquette thanked Minister Goodale for coming to his community days after Hurricane Matthew, and for Public Safety Canada’s swift action, in partnership with the Nova Scotia Emergency Management Office, unveiling the Disaster Financial Assistance Package. The Minister praised the speed at which all levels of government worked to ensure that communities were safe and recovering. Within a week, families across Cape Breton and beyond were able to apply for disaster financial assistance, and within a year, 90% of the 1185 applications received were complete. Mr. Ruffman recounted the events of December 6, 1917, when the Norwegian vessel SS Imo collided with SS Mont-Blanc, a French cargo ship laden with high explosives, in the Narrows, a strait connecting the upper Halifax Harbour to Bedford Basin. Mr. Ruffman’s research and presentation were enriched by contemporary accounts, photography and artistic depictions of the Halifax Explosion and its aftermath. Dr. Baingo presented a simulation of what the Halifax Harbour Explosion would look like if it were to happen today. While modern infrastructure is much more resilient than it was 150 years ago, Dr. Baingo emphasized the complex nature and the particular risks associated with blasts in urban environments. The simulation was built using Rapid City Planner, a physics-based model developed by DRDC that takes into account the chemistry of an explosion, the resultant shockwave, and its evolution through obstacles and the city. This type of computational modeling has been applied to various security domain applications, such as the planning of operations for the 2010 Vancouver Winter Olympics. It provides the evidence necessary to influence decision-makers to make risk-informed decisions. Mr. Glasser’s keynote address put the discussions happening at and around the Roundtable in the international context. He spoke about Disaster Risk Reduction (DRR) in the context of the global effort reflected in the Sendai Framework; he drew links between DRR and Climate Change Adaptation (CCA); and then discussed the concept of Building Back Better. Mr. Glasser highlighted the broader international context of disasters by describing their increasingly destructive nature over the last decades with 1.34M lives lost in the last two decades, and $2.5T in economic losses and $520B lost in global consumption, annually. Although the numbers of lives lost in disasters has decreased globally, Mr. Glasser pointed out that the economic costs continue to increase. Furthermore, even though there are fewer deaths, disasters have a vastly disproportionate impact on developing countries and pockets of poor communities even in wealthy countries. This is one reason the United Nations has stated it will not be able to achieve the Sustainable Development Goals globally if disaster risk is not properly addressed. Mr. Glasser maintained that there have been some successes, but that for many countries, the economic costs continue to rise, in many places faster than GDP for two main reasons. The first is economic growth; as the planet develops economically, there is more infrastructure to lose in a disaster. However, Mr. Glasser pointed out that it is specifically the continued investment in infrastructure that is exposed, vulnerable and poorly risk-informed that is increasing this cost. Secondly, climate change, particularly the increase in extreme weather that is linked to the warming climate, is increasing in frequency and severity. Mr. Glasser argued that the first step in building these partnerships is in recognizing the links between climate change and disaster risk. Although there are some elements of each that are not directly connected, the majority of major disasters are hydro-meteorological, that is, disasters that are caused, or exacerbated, by climate change. Mr. Glasser spoke about the redundancies that he sees in some governments, where one department will embark on a wide consultative process to develop a climate adaptation strategy and another department will organize a very similar process to develop a disaster management strategy. They then each bring separate proposals forward for funding, which Mr. Glasser said is a redundant and ineffective approach. He said that it is very important for both communities to work together by integrating their expertise and efforts. Although the impacts of climate change have become part of the discussions taking place about disaster risk, there remains to be seen a full appreciation for the cascading impacts of climate change. A warming planet means more simultaneous disasters, with multiple hazards striking with greater frequency and severity, leading to cascading crises beyond the realm of natural disasters, leading to, in some cases, conflict between and within nations as resources and economies are strained. For Mr. Glasser, this is why reducing greenhouse gases as quickly as possible becomes the most urgent disaster risk treatment for all the other issues being discussed. That being said, Mr. Glasser also added that he was optimistic that change and improvement are possible, because of what he was seeing with, among other things, energy technology, with policies to reduce greenhouse gas emissions, and with the adoption of green technology. Mr. Glasser explained that managing disaster risk requires embedding risk and knowledge about disasters into all investments and decisions. Understanding data on disasters is critical, including their historical costs, their type, their frequency, and their geographic location. However, economic development and climate change have decreased the ability to rely on the past to anticipate future risk. Developing risk profiles and incorporating disaster risk into decision-making become critical tools in disaster risk management. Overall, Mr. Glasser noted the importance of addressing three key factors. First, an understanding that risk may require government to make specific interventions and investments to reduce risk. Secondly, he explained that all capital investments must be risk informed, right down to the Request for Proposals and key disaster risk questions addressed. If new investments in infrastructure, such as those by the OECD are not risk informed, Sendai targets will not be met and billions of dollars wasted. Finally, there is the concept of Build Back Better, which is enshrined in Sendai. It’s tragic and devastating every time there’s a disaster, which is all the more reason to grasp the opportunity to make large, necessary changes. Mr. Glasser observed that post-disaster, there are often calls for changes and a certain political energy and that seizing those moments is crucial. Having recommendations in place, whether through legislation that should be enacted or something else, there is a golden moment to be acted upon in order to make important changes in the face of terrible tragedy. Mr. Glasser concluded by noting that in virtually every country in the world there are groups who understand the importance of this issue coupled with an international agreement where countries have committed to addressing these challenges and reporting on their progress. Using the power of the community-based, people-centered approach top risk reduction with national, regional meetings and global meetings creates additional pressure and opportunity for countries to reduce disaster risk and to support what governments, civil society scientists etc. are trying to achieve in this important area. Produce guidance that will help ensure Build Back Better is the de facto standard for all levels of government, as well as the private sector. An exchange of information and the creation of an inventory of solutions and innovations to the implementation of Building Back Better across all sectors of society. Dr. Feltmate presented the business case for committing to Building Back Better, specifically looking at the growing costs of extreme weather driven by climate change. He also looked at flood-resilient community design as an example of how to successfully implement Build Back Better. Participants were then invited to break out into four groups for an all-sector discussion of the challenges they face in implementing the concept of Build Back Better in their respective professions, industries and communities. The results of these discussions were synthesized and presented in plenary on Day 2.
Review the origins and priorities of Canada’s Platform for Disaster Risk Reduction and allow the membership to provide input on its future direction and focus in order to best position itself and the membership to reach its/Sendai targets. A list of recommendations (policy options, programs, tools, structural changes) for the renewal and future of Canada’s Platform for Disaster Risk Reduction. One of the most resonant themes was the call for more opportunities to collaborate and network with colleagues in the same and related fields, including greater collaboration with the private sector. The presence of a silo culture was determined to be a significant challenge to overcome in order to create more and better opportunities for meaningful collaboration. Many participants appreciated the partnership between Canada’s Platform for Disaster Risk Reduction and Climate Change Adaptation Platform. Participants called for stronger engagement with their colleagues, with other federal government departments, as well as provinces, territories and municipalities. Participants also called for greater engagement with Indigenous peoples, who face greater challenges in every aspect of disasters. They felt this would require greater leadership, education and outreach, funding for research and the integration of scientific knowledge across FPT governments, regional meetings, and leveraging SOREM. Many saw the Platform as an ideal mechanism to be a repository for information that would not only assist in educating the Canadian public but also provide another level of information sharing for EM professionals. Furthermore, one of the biggest issues raised about the Platform and the Roundtable was the lack of knowledge participants and non-participants had about its existence, mandate, etc. Creating and promoting greater awareness and sharing its activities is deemed necessary and interwoven with the need for greater collaboration. Participants called for a strong online presence to be created with a centralized database that would, among other things, outline best practices and lessons learned; this was consistently raised as an important need that would provide significant value. Participants would like to see more sharing of and access to data as well as further research / affiliations with academia. Stéphanie Durand, Director General, Emergency Management and Programs at Public Safety Canada and the National Chair of Canada’s Platform for DRR, and Christopher Jennings, Director, Climate Change Impacts and Adaptation at Natural Resources Canada, were the masters of ceremonies on the second day of the event. Minister Rankin spoke about how Nova Scotia is seeing the real effects of climate change, including more extreme weather and more severe storms, and recognized the province’s vulnerability as a coastal province. He spoke about the shared costs of climate change, from repairing significant storm damage to paying higher food bills after crops are damaged by drought. He also mentioned the social costs, particularly from a health perspective. He said that climate change must be fought on two fronts: one, by reducing the human activity that causes climate change in the first place, and the other, by reducing the risk of disasters by increasing our adaptation efforts and resilience. Minister Rankin maintained that the work being done by all governments and partners in disaster risk reduction and climate change adaptation must be collaborative and coordinated to identify risks, seek opportunities to reduce them, and prepare for impacts that cannot be fully mitigated. He ended on a positive note, noting that although most of the focus with climate change adaptation is rightly placed on mitigating risks, there are also potential opportunities. For example, a warmer climate may mean more growing days for agriculture and a longer tourism season. Adapting to climate change means adapting to every facet of it. Mr. Tanguy spoke about the progress being made in addressing disaster risk reduction and climate change adaptation, including in the important partnership between Canada’s Platform for Disaster Risk Reduction and Climate Change Adaptation Platform, which has led to the creation of floodplain mapping that will address one of the costliest disasters in Canada. Mr. Tanguy also spoke about some of the work being done by Public Safety Canada. He mentioned the Flood Risk Roundtable, led by Minister Goodale, and the Emergency Management Strategy for Canada that will complement other horizontal initiatives, including the pan-Canadian Framework for Clean Growth and Climate Change, which identifies the risk of climate related hazards as a key goal. Dr. Lemmen spoke about three international frameworks that are all focused on building resilient societies: the Sendai Framework for Disaster Risk Reduction, the Paris Climate Agreement, and the Sustainable Development Goals. He stressed the relevance of the sustainable development goals for all countries, both developed and developing, and their critical role in building the enabling environment for actions that seek to advance both disaster risk reduction and climate change adaptation. He noted that the three frameworks form a natural and powerful alliance. The decision to implement the Paris agreement starts with welcoming the adoption of the Sustainable Development Goals and the Sendai Framework. The Sendai Framework notes that “disaster, many of which are exacerbated by climate change and which are increasing in frequency and magnitude, significantly impede progress towards sustainable development.” And, finally, the agenda associated with the Sustainable Development Goals notes that climate change is one of the greatest challenges of our time and its adverse impacts undermine the ability of all countries to achieve sustainable development. Dr. Lemmen described his experience as the co-chair of the adaptation committee under the United Nations Framework Convention on Climate Change organizing technical expert meetings. At these meetings, it became evident that the silos of climate change adaptation, disaster risk reduction and sustainable development largely disappear at the practitioner stage. He expressed his excitement that the meeting had sessions highlighting a number of lessons learned from on-the ground experiences that will help strengthen the dialogue between our various communities. To close, Dr. Lemmen stated that the conversation would continue with a goal for the Climate Change Adaptation Plenary meeting the following day to operationalize the learnings of the previous two days and identify actions for the 35 member organizations to integrated disaster risk reduction, climate change adaptation and sustainable development into their own activities. A list of potential tools, technologies, programs, and policies that communities could consider adopting in their post-recovery disaster plans. Blair Feltmate returned to moderate a panel comprising one of the two facilitators from each of the Build Back Better breakout sessions on Day 1. Q What are the challenges to Building Back Better? How do we address or circumvent these challenges? The themes that came out of the breakout sessions fell into three main categories: political, economic, and informational challenges. Participants emphasized the importance of seeing the political landscape in which discussions about DRR take place for what it is. Whether talking about the federal government, provincial governments, municipalities, Indigenous peoples, NGOs, and other public and private organizations, it is important to identify that all of these groups are made up of individuals with different needs and objectives that don’t always correspond to the same perspective on what is “rational” or “optimal”. Aside from greater political will, participants agreed that greater collaboration, especially institutionalized, long-term collaboration, not only between levels of governments, but between actors from all sectors of society is necessary, including Indigenous peoples, banks, utility companies, and homeowners themselves. Participants said that greater collaboration can be achieved by multi-lateral multi-stakeholder engagement. Participants spoke about the costs, both real and perceived, of building back better. Building it right the first time is seen as costly by developers; building back better after the fact is seen as costly by insurers, or by governments who are footing the bill for rebuilding or losing part of their tax base when households are relocated. However, most participants agreed that much on this front can be done inexpensively. Many tools and strategies were put forward that are not expensive if done proactively, and most participants agreed that the way to enshrine these practices is by educating all relevant actors and decision-makers, from public health and safety officials to insurers and homeowners, among many others. Indeed, a lack of information and education was one of the most common obstacles faced by participants. This problem manifests itself in many different ways: a lack of risk data, a lack of standardization in the way that risk is assessed, a lack of economic data for return on investment for building back better, a lack of understanding of climate change science, a lack of education and training for relevant actors and decision-makers. Participants also emphasized the need to better understand and incorporate climate science and forecasts in disaster risk reduction, as well as the need to consider the implementation of natural infrastructure in building back better. Explore gaps and share information on how to build back better and support Canada’s efforts to implement this priority of the Sendai Framework, based on the panelists’ field expertise in disaster risk reduction and climate change adaptation. A list of barriers and enablers to build back better to reduce disaster risk and the effects of climate change. Each panelist was invited to discuss their particular fieldwork. Mr. Westhaver discussed his experience studying the BC wildfires. He explained that it is not just the wildfires themselves that is the main issue, rather it is when wildfires meet structures and turn into wildland urban interface fires. There is no easy solution to address these types of situations; there are wider groups of stakeholders and discussions that come into play. The current focus is on response and recovery, but a stronger emphasis on risk mitigation is required. Mr. Westhaver put forward Fire Smart as an example of a good program focused on reducing losses and the impact of wildfires on communities using universal practices. Mr. Charles presented his findings from his work during Hurricane Juan. One of the lessons learned from this event was the need to better understand topography and have more accurate mapping to properly assess the risk to existing and new infrastructure, including green infrastructure. For this, greater collaboration between all levels of government is fundamental. Dr. Pearce spoke about her work examining the displacement of Indigenous populations. These populations are more vulnerable to climate change based on their geography and the loss of a more nomadic way of life. These communities’ vulnerability is further exacerbated by evacuations from remote rural areas to, often, urban locations. This separation from their home, land, traditions, and food sources creates further stress, which often leads to illness. Ms. Jebrak demonstrated that there is a major underestimation of risk in the field of urban planning. She explained this was largely due to both a lack of understanding and a denial of risk due to an attachment to place and to current tools and methodologies. The more removed that decision-makers are from the field, from the visceral experience of disasters, the less the impact on understanding. Therefore, Ms. Jebrak argues that new means of transmitting knowledge and experiences through the collective memory should inform or replace the traditional top-down approach. Mr. Burton summarized the session by noting that disasters may be based in nature but their level of impact is often a result of the choices made by a society and a more transparent decision making process was encouraged. He also lauded the important rise of a social movement wanting change and increased resiliency that requires leadership from, but not complete reliance on, government. Raise awareness of Indigenous emergency management and evacuees and provide a forum for discussion on how to improve the quality of response and care for those most affected by disasters. Increase awareness of Indigenous emergency management and evacuees and share ideas for improving well-being during evacuations. This session introduced the topic of Indigenous emergency management and evacuees for the first time at the Roundtable. First Nation peoples are evacuated from Reserves in Canada at a rate much higher than any other population in the country. The panel brought together representatives from the Assembly of First Nations, affected First Nations communities, Indigenous Services Canada, the Canadian Red Cross, and academia to provide their perspective on whether the policies and programs currently in place adequately meet the needs of Indigenous peoples most affected by disasters. Discussion also provided more insight into where everyone can play a greater role in ensuring the safety of the individuals and families removed from their homes during emergency evacuations. The panelists referred to the case of Kashechewan First Nation, an Indigenous community that was evacuated due to flooding concerns. As of the time of this discussion, there were still evacuees living in hotels and displaced to new surroundings. Dr. Murphy spoke about the development of a Guide for Displaced Indigenous Peoples to meet the needs of long-term Indigenous evacuees, identify different cycles of evacuation, and best practices to be adopted in such cases. She stressed the importance of proximity to their homes, the availability of local foods, the needs of elders, emotional wellness support, and support and activities for younger people. Mr. Diabo emphasized the importance of going beyond procedural evacuation issues to address humanistic, psycho-social issues noting that many Indigenous evacuees experience cultural dislocation when moved to large urban environments and have to relearn how to live. Young individuals, whose cultural roots are impacted, are particularly affected. Ms. Hodder spoke about the evacuation agreement that exists between the Canadian Red Cross and Indigenous Services Canada in Manitoba. This plan includes identifying and evacuating at-risk communities in southern Manitoba by leveraging volunteer participation and partnerships with different government and non-governmental organizations. Ms. Hodder emphasized the importance of working with, and obtaining the support of, First Nation leadership, including Chiefs and Councils, as well as communicating effectively and working together with leadership and all evacuees. She argued that the $25,000 per person, or $850M total, cost of evacuation in this case could better be spent on mitigation efforts. Increase the knowledge and understanding of climate change adaptation efforts underway in Nova Scotia and understand the connections between on-the-ground climate change adaptation efforts and disaster risk reduction. Identify climate change adaptation efforts underway in Nova Scotia, factors important to the implementation of climate change adaptation initiatives, and the links between on-the-ground adaptation efforts and disaster risk reduction. In Nova Scotia, the provincial and municipal governments and civil society institutions are carrying out adaptation projects to minimize the increased risks associated with climate change. This interactive session featured a panel of leaders discussing how their adaptation work is reducing climate risk in Nova Scotia, with a focus on how diverse components such as research, stakeholder engagement, and scientific and technical studies are all essential elements in moving from research to action. Ms. Page spoke about the issue of sea level rise and the particular threat it poses to Nova Scotians living along the shoreline. She said that the ultimate goal of incorporating sea level rise in community planning strategies would require behavioural change. Her strategy for bringing about this change is rooting the message in emotion and compassion, speaking to disaster and risk at the human level. She added that this would also be a good strategy to break through the layer of isolation often felt by smaller municipalities. Ms. Mackenzie-Carey spoke about risk analysis, including using climate research to make more accurate and effective predictions, and to speak to not only the probability of events, but also to their severity. She said it is important to make this research and data available so that communities can arm themselves with the knowledge necessary to be better prepared. Mr. Bekkers spoke about the importance of stakeholder engagement, creating networks and partnering with researchers, in order to update the standards by which existing infrastructure is improved and new infrastructure is created. He mentioned that a lack of national guidelines and standards for implementing build back better policies is one obstacle to horizontal dissemination of the types of changes necessary. Outline the important considerations for coastal risks in Canada and the various tools and measures available for climate change adaptation and disaster risk reduction in Coastal Regions. Coastal areas are a significant part of Canada’s economy, culture, ecology and the well-being of Canadians with approximately 6.5 million Canadians living near marine coasts and coastal regions accounting for 500 billion a year in trade; they are also important for tourism and transportation. Climate change affects several drivers of coastal change including: accelerated sea level rise; increased storm intensity; destabilization of permafrost; reduced sea ice thickness, duration, extent; more energetic wave climates; rising sea-surface temperature and ocean acidification. These coastal risks have impacts such as more flooding, habitat destruction, saline intrusion into fresh water aquifers, erosion, land loss and damage to coastal infrastructure. A range of adaptation measures are needed to address the complexity and varied nature of the problems being faced by Canada’s coasts. Bring together experts in the field of resilient infrastructure to discuss the needs and key elements for success (lessons learned) and opportunities that lay ahead to ensure that the investments made over the next decade and beyond, including those made via the Investing in Canada Plan, help reduce vulnerability, improve capacity, and build more adaptable and resilient communities. Raise awareness of key Infrastructure Canada and Federation of Canadian Municipalities programs that relate to adaptation, resilience and disaster mitigation, and provide participants with the ability to use key lessons learned to integrate climate change adaptation into infrastructure investments. New federal investments are coming online that will help us to work with the provinces and territories and other partners and stakeholders, to help communities deal with climate change. For example, $9.2 billion has been allocated for green infrastructure, including projects supporting greenhouse gas (GHG) mitigation, environmental quality, as well as adaptation, resilience and disaster mitigation. There will be a $2‑billion disaster mitigation and adaptation fund. This fund is for larger projects and will be allocated on a merit-based process. In addition, we are supporting the National Research Council via an investment of $40 million-plus to update building codes, create guides and guidelines to ensure our infrastructure is more resilient toclimate change. The federal government is also looking at adding a new climate lens to its evaluation of new projects in areas such as infrastructure, public transit, rural and Northern communities, culture and recreation. With this lens, we will look at the impact of both GHG emissions and resilience to climate change. It will take a long time to get rid of GHGs, which we know cause climate change. In 100 years, 60 percent of current GHG levels in the atmosphere will remain. In 1,000 years, 25 percent will remain. There is no time to lose in becoming more resilient. Our infrastructure has been designed using historical records. But the past is now less indicative of what infrastructure has to resist in future. Our aging infrastructure is due and overdue to be replaced. This means added vulnerability, but also an opportunity. Half of the infrastructure that we will see in 2030 has yet to be built. We have an opportunity to do it right, to make it last. Similarly, we need more information in order to build back better after a disaster, rather than just building back quickly. Note that one set of climate design values doesn’t apply to all. As well, infrastructure vulnerability is not linear. Rather, failure can increase exponentially. For example, from a certain point, a 10-percent increase in wind speed can lead to multiple-hundred-percent increases in damage. There is also an added complication in that old numbers may not stand the test of time. In addition, we know more about how to deal with extreme heat than how to deal with severe precipitation, wind storms, ice storms and tornados. This leads to the question of what can we do. New infrastructure will be built over the next 20 years or more. Meanwhile, we also have to maintain or retrofit existing infrastructure. There will be increased attention to liabilities and disclosure of risk. Work is under way to update climate numbers for 2020 and later codes and standards. But we also have to work with increasingly vulnerable current infrastructure. Many engineers have the know-how needed to make assets more resilient. Convincing owners, however, is another question. Because existing infrastructure is more vulnerable to changing extremes, we must be prepared for more emergencies. We need hazard mapping. We need codes and standards. We need good climate data. No one government agency has the money to do it all, but we have to find a way to do it. Risk assessments are important. Once organizations become aware of the risk they face, they often act. Sometimes actions don’t cost that much. Other times, we need to set priorities. Staged adaptation can also be pursued (e.g., building a berm to which another meter of height can be added later). There are gaps between research, R&D and science on the one hand and decision-ready information needed for action. On the other hand, we can’t afford to wait for perfection in these matters either. The Federation of Canadian Municipalities (FCM) is concerned with sustainable infrastructure. FCM will do things that many of you can get support for. In Canada, we have 3,657 municipalities. Of that total, 78 percent have a population of less than 5,000 people. Sixty percent of infrastructure is owned by municipalities. But small communities have challenges in making decisions on infrastructure that are well informed and appropriately funded. We need difference approaches to governance. There is a need to bring business processes to asset management and bring climate change into the discussion. Many communities are not doing much on asset management and climate change. Even in larger communities, there are silos between different assets and different decision-makers. Communities concerned about climate change don’t always know how to use the information that exists. There is a need to get citizens and councilors on board on why we need to take account of climate change. But scarce resources are needed to build business cases for appropriate decisions and to get issues on decision-makers’ agendas. How can we help municipalities to make adaptation part of their business? We have $186 billion over the next 12 years to support infrastructure in Canada. There is also new thinking about how to build. There is an opportunity for shared approaches to addressing issues in communities across Canada. As well, tools exist across Canada. We have to leverage those tools. We are making $47 million available over the next three-and-a-half to four years for vulnerability assessments, solutions, staff persons, etc. To date, 36 percent of funds have been earmarked for adaptation, versus 64 percent for mitigation. Our goal is to increase funds for adaptation to 60 percent. We need to focus on respecting consultation; adequate resourcing; and integration. Regarding consultation, First Nations’ needs are different. We have to recognize the duty to consult, the impact of historical relationships and develop cultural awareness and sensitivity. Rural and Indigenous communities have distinct infrastructure strengths and challenges. This is even more so in remote and isolated communities where access is limited to airplanes or boats. Each community has different needs. One size does not fit all. Have to work on what will work in each community. There also is a need to access local and traditional knowledge. By empowering and supporting local abilities and talents, projects can be made much stronger. Resourcing must be adequate and efficient. Funds must match needs, which are different in each community. Funds must be targeted for rural and indigenous communities. We need to differentiate between distinct needs of larger communities, smaller communities and Indigenous communities and be aware that some communities lack the capacity to access funding (e.g., how to apply for a grant). After a disaster, communities may lack the means to build back better. Therefore, they build back to the old standards, leaving them no better off or worse off if climate change impacts worsen. Jurisdictional barriers can impede efficient and cost-effective action, while mutual aid and service-sharing between jurisdictions can be highly effective. For mutual aid and services agreements to work: know your hazards, needs and capacities; do a risk assessment; know what you need from others; and make sure that what they have will meet your needs. There is a need for socio-ecological integration in decision-making regarding constructed and natural physical systems, leading to a suite of needed or desired services and the human systems that manage physical systems. Any of the pieces may need adjustment, mitigation or adaptation. Climate change thinking must not be exclusively contained in emergency management. Climate change impacts must be addressed across disciplines. The 2017 Roundtable garnered much interest, with approximately 250 attendees in person and countless others who participated virtually across all levels of government, the private sector, Indigenous peoples, non-governmental organizations, academia, and the general public. To gather feedback on the event and inform the planning of future events, an evaluation survey was provided at the Roundtable and electronically to participants. The general feedback received from respondents indicated a significant level of satisfaction following the event. 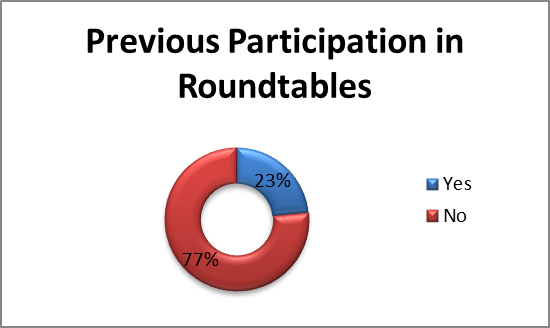 The chart demonstrates the percentage of Roundtable participants by different sectors of society. 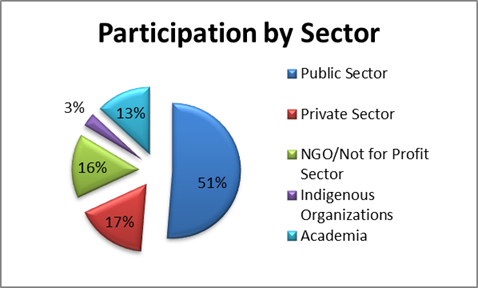 Of the all 253 participants who attended, 51% represented the public sector (+8%)*; 13% represented academia (-6%)*; 16% represented non-governmental organizations (NGO) (+2%)*; 17% represented the private sector (+5%)*, and 3% represented Indigenous Organizations. 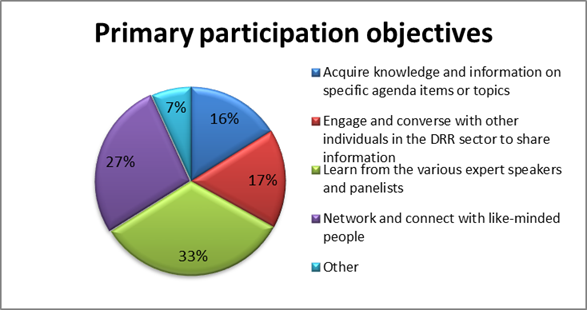 Other objectives included the following: 17% Engage and converse with other individuals in the DRR sector to share information, 16% Acquire knowledge and information on specific agenda items or topics and 17% Other. 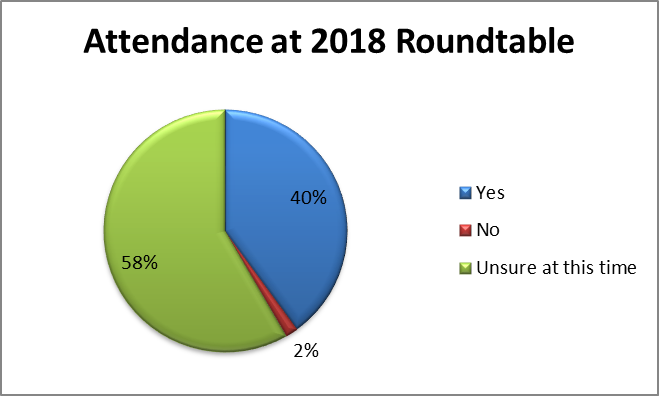 The survey results in this chart demonstrate that 77% (+15%)* of respondents never previously attended a Roundtable event, and 23% (-15%)* of respondents previously participated in a Roundtable event. The chart illustrates the expectation levels of respondents following the Roundtable event. 28% of respondents’ expectations were exceeded (-1%)*; 64% of expectations were achieved (+15%)*; 8% expectations were somewhat achieved (-13%)*; and 0% expectation were not achieved (-1%)*. 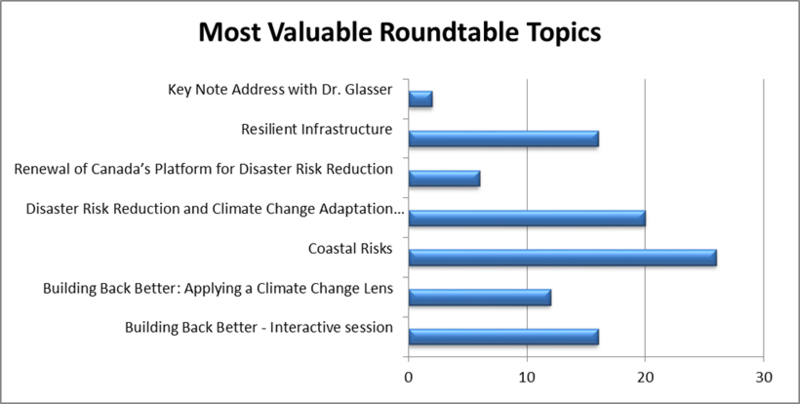 This chart illustrates that the topics of “Costal Risks” and “Disaster Risk Reduction and Climate Change Adaptation” generated the most interest and were identified as most valuable topics of discussion by the respondents. The next most valuable roundtable topics (from highest to lowest interest) were “Building Back Better – Interactive session”, “Resilient Infrastructure”, “Building Back Better: Applying a Climate Change Lens”, “Renewal of Canada’s Platform for Disaster Risk Reduction”, and “Key Note Address with Dr. Glasser”. 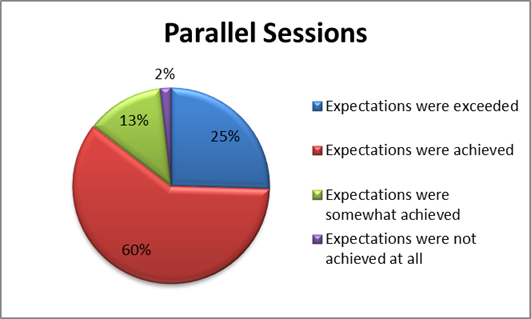 The chart illustrates the range of satisfaction levels from respondents related to the parallel sessions. The results were positive with 25% of respondents with exceeded expectations (+15%)* and a 60% of respondents with achieved expectations (+19%)*. 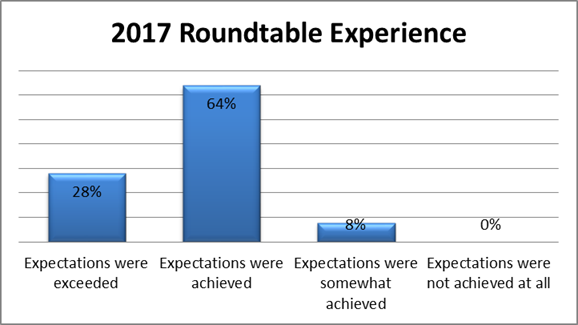 Only 13% of respondents with somewhat achieved expectations and 2% with expectations not achieved at all. Participants were asked if they plan on attending the 2018 Roundtable. The results show that 58% of respondents desire to attend the event next year (+2%)*, 40% of respondents were unsure (+7%)* and only 2% or respondent answered that they were unable to attend (-5%)*. The following is a list of suggested themes identified by respondents for future Roundtable events.